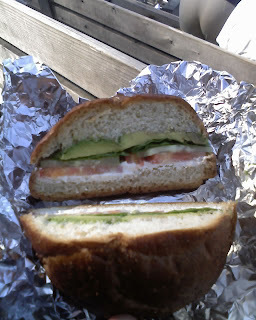 Above: Vegan cream cheese, tomato, cucumber, and avocado. 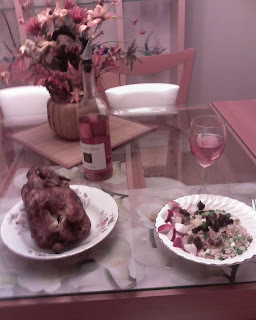 Above: Rotisserie lemon-pepper chicken (store-bought) with brown rice, sundried tomatoes, cut-up green onions, and radishes. My version had soy chicken nuggets, though I will admit that some drippings from the rotisserie got in there. =O And yes, that's some cheap wine from Trader Joe's. 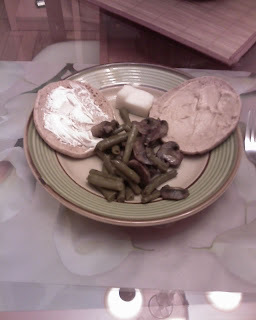 Above: This past weekend... canned green beans w/mushrooms, sandwich thin with vegan cream cheese and hummus (not combined), and a small block of vegan cheese to munch on. Admittedly, I ended up biting some havarti (sp?) cheese from "his" plate. Above: "His" plate. I also had some of these crescent rolls (from a can, unfortunately). 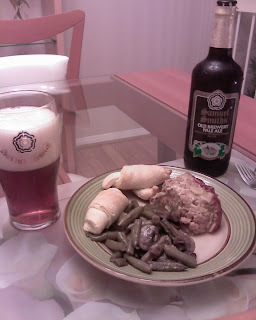 The thing on the right is turkey meatloaf, which I made out of some left ground turkey meat referenced here. The imported beer is from World Market. It was very bitter. I shouldn't have tried (i.e., had a few sips) any, as I had just downed 1 Tylenol pill for a headache and ended up falling asleep after eating. Fortunately, the headache disappeared when I awoke. You've been eating some strange stuff. That sandwich looks well made, like something you would buy at a restaurant!